We believe vehicle maintenance is a critical component of a safe, reliable and successful school bus operation. That’s why we have established systems and processes that allow our maintenance department to work together with our operations and safety departments. 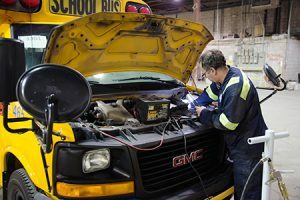 Our school bus maintenance program blends a traditional “preventive maintenance” approach with an innovative “predictive maintenance” approach. The program is built on a regular prescribed schedule of bus inspections that allows us to proactively repair vehicles before breakdowns occur. The schedule is adjusted to match the variations of the school year – school start-up, cold weather, summer vacation, etc. All components affecting the operation of the vehicle – from tires to brakes to exterior body – are examined according to a specific schedule and repaired or replaced as determined by established criteria.